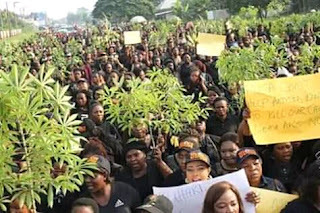 AKWA IBOM WOMEN, RECEIVE SENSE!! *when the great teacher was romancing and teaching his great student, they didn't know you. *when Onofiok Luke received his political blessings from the Warsaw lord, you were contending with the abject poverty they forced on you. And now that the going isn't good again, they now remember that you exist, forced you to wear black and go on the streets hungry and you were stupid enough to plug cassava leaves from the farms of fellow women (some of them were made widows by these same men) who suffer same fate of negligence like you. Allow them to kill themselves just as they used to gang up to humiliate us.